LG Electronics Inc. (Hangul: LG 전자; RR: LG Jeonja) is a South Korean multinational electronics company headquartered in Yeouido-dong, Seoul, South Korea, and is part of LG Corporation, employing 82,000 people working in 119 local subsidiaries worldwide. With 2014 global sales of USD 55.91 billion (KRW 59.04 trillion), LG comprises four business units: Home Entertainment, Mobile Communications, Home Appliances & Air Solutions, and Vehicle Components, with Starion India as its main production vendor for refrigeration and washing machines in the Indian sub-continent. The CEO of LG Electronics is Koo Bon-joon, who assumed the role of vice chairman of LG Electronics on 1 October 2010. Since 2008, LG Electronics remains the world's second-largest television manufacturer. In 1958, LG Electronics was founded as GoldStar (Hangul:금성). It was established in the aftermath of the Korean War to provide the rebuilding nation with domestically-produced consumer electronics and home appliances. LG Electronics produced South Korea's first radios, TVs, refrigerators, washing machines, and air conditioners. GoldStar was one of the LG groups with a brethren company, Lak-Hui (pronounced "Lucky") Chemical Industrial Corp. which is now LG Chem and LG Households. GoldStar merged with Lucky Chemical and LS Cable on 28 February 1995, changing the corporate name to Lucky-Goldstar, and then finally to LG Electronics. LG Electronics earned US$100 million in revenue from exports for the first time in its history. Rapid growth by globalization saw the company establish its first overseas production, based in the United States, in 1982. In 1994, GoldStar officially adopted the LG Electronics brand and a new corporate logo. LG Electronics acquired the US-based TV manufacturer Zenith. In 1995, LG Electronics made the world's first CDMA digital mobile handsets and supplied Ameritech and GTE in the US. The company was also awarded UL certification in the US. In 1998, LG developed the world's first 60-inch plasma TV, and in 1999 established a joint venture with Philips – LG.Philips LCD – which now goes by the name LG Display. In order to create a holding company, the former LG Electronics was split off in 2002, with the "new" LG Electronics being spun off and the "old" LG Electronics changing its name to LG EI. It was then merged with and into LG CI in 2003 (the legal successor of the former LG Chem), so the company that started as Goldstar does not currently exist. LG Electronics plays a large role in the global consumer electronics industry; it was the second-largest LCD TV manufacturer worldwide as of 2013. By 2005, LG was a Top 100 global brand, and in 2006 LG recorded a brand growth of 14%. Its display manufacturing affiliate, LG Display, as of 2009 was the world's largest LCD panel manufacturer. In 2010, LG Electronics entered the smartphone industry. Since, LG Electronics continued to develop various electronic products, such as releasing the world's first 84-inch ultra-HD TV for retail sale. On 5 December 2012, the antitrust regulators of the European Union fined LG Electronics and five other major companies (Samsung, Thomson since 2010 known as Technicolor, Matsushita which today is Panasonic Corp, Philips, and Toshiba) for fixing prices of TV cathode-ray tubes in two cartels lasting nearly a decade. On 11 June 2015, LG Electronics found itself in the midst of a human rights controversy when The Guardian published an article by Rosa Moreno, a former employee of an LG television assembly factory. At the end of 2016, LG Electronics merged its German branch (situated in Ratingen) and European headquarter (situated in London) together in Eschborn a suburb of Frankfurt am Main. In March 2017, LG Electronics was sued for its handling of hardware failures with recent smartphones such as the LG G4. In November 2018, LG announced Hwang Jeong-hwan, who took the job as president of LG Mobile Communications in October 2017, will be replaced by Brian Kwon, who is head of LG's hugely profitable home entertainment business, from 1 December 2018. LG Electronics has four business units: Home Entertainment, Mobile Communications, Home Appliances & Air Solutions, and Vehicle Components. The company has 128 operations worldwide, employing 83,000 people. LG Electronics owns Zenith and controls 37.9 percent of LG Display. LG Electronics' products include televisions, home theater systems, refrigerators, washing machines, computer monitors, wearable devices, smart appliances, and smartphones. The LG SL9000 was one of several new Borderless HDTV's advertised for release at IFA Berlin in 2009. LG Electronics launched an OLED TV in 2013 and 65-inch and 77-inch sizes in 2014. LG Electronics introduced its first Internet TV in 2007, originally branded as "NetCast Entertainment Access" devices. They later renamed the 2011 Internet televisions to "LG Smart TV" when more interactive television features were added, that enable the audience to receive information from the Internet while at the same time watching conventional TV programming. In November 2013, a blogger discovered that some of LG's smart TVs silently collect filenames from attached USB storage devices and program viewing data, and transmit the information to LG's servers and LG-affiliated servers. Shortly after this blog entry went live, LG disabled playback on its site of the video, explaining how its viewer analytics work, and closed the Brightcove account the video was hosted on. LG's remote uses Hillcrest Labs' Freespace technology to allow users to change channels using gestures and Dragon NaturallySpeaking technology for voice recognition. As of 2014, LG is using webOS with a ribbon interface with some of its smart TVs. LG reported that in the first eight months after release, it had sold over 5 million webOS TVs. In 2016, exclusively to India, Indian arm of South Korea's LG Electronics Inc started selling a TV that would reject mosquitoes. It uses ultrasonic waves that are silent to humans but cause mosquitoes to fly away. It was released on 16 June 2016. The technology was also used in air conditioners and washing machines. The TV is aimed for lower-income consumers living in conditions that would make them susceptible to mosquitoes. In 2018, LG revealed it would begin to selling big-screen televisions that could be rolled up and retract automatically with the push of a button come 2019. LG Electronics manufactures a wide range of smartphones and tablet devices. Other than the G3, LG officially unveiled the curved smartphone, G Flex, on 27 October 2013. LG has released it in South Korea in November 2013, and later announced releases in Europe, the rest of Asia, and North America. At Consumer Electronics Show in January 2014, LG announced a U.S. release for the G2 across several major carriers. In 2015, LG has released LG G4 globally in late May through early June. On 7 September 2016, LG unveiled the V20, and the V30 was announced on 31 August 2017. LG G6 was officially announced during MWC 2017 on 26 February 2017. The introduction of the G7 ThinQ model was scheduled for a 2 May 2018 media briefing. In 2014, LG revealed three new additions to the G series of tablets, which each include LG's Knock Code feature, allowing users to unlock devices with a series of taps. The tablets also feature Q Pair which allows tablets to sync up with a smartphone, and for phone calls and text messages passed on to the tablet in real time. LG and Google announced the Android Wear-based smartwatch, the LG G Watch, that was in June 2014. In August 2014, the LG G Watch R that has a circular face (similar to the Moto 360) was released. 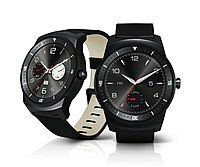 The LG Watch Urbane that LG's third Android Wear-based smart watch has released in April 2015. This was the first device to support newer smartwatch features such as Wi-Fi, and new parts of Android Wear's software interface, like the ability to draw emoji to friends. In 2015, LG announced the first Bluetooth keyboard that folds up along the four rows of keys that can be tossed in a purse or pocket. The Rolly keyboard is made of solid plastic. Two tiny plastic arms fold out from the end of the keyboard to support a tablet or smartphone, and it can toggle between two different Bluetooth-connected devices at a time. Battery life is an expected three months on a single AAA battery. LG manufactures and sells home appliances such as refrigerators, washing machines and tumble dryers, vacuum cleaners, kitchen appliances, and air conditioners and even microwave ovens. In June 2014, LG Electronics also announced the launch of its smart appliances with HomeChat messaging service in South Korea. HomeChat employs LINE, the mobile messenger app from Korean company 'Naver', to let homeowners communicate, control, monitor and share content with LG's smart appliances. Users can send simple messages, such as "start washing cycle," in order to control their washing machines. LG owns the Korean Baseball Organisation (KBO) LG Twins (LG 트윈스). The team is one of the founding members of the KBO, established in 1982, although LG took over ownership of the team in 1989. The team has won two Korean Series (1990 and 1994), although their loyal and large fan base has been starved of success since relative to the budget and size of the club in the KBO. That said, LG continues to attract the largest average attendance out of all KBO teams and has emerged from its slump to become regular playoff contenders in recent years. In August 2013, LG Electronics announced that it would sponsor German Bundesliga club Bayer 04 Leverkusen for the next three years with an option to extend for one more year. In the U.S., LG Electronics' brand and product advertisements can be seen in Dodger Stadium of the Los Angeles Dodgers and Great American Ball Park of the Cincinnati Reds. LG sponsors the International Cricket Council, the world governing body for cricket, and also sponsors ICC Awards. From 2009 to 2013, LG Electronics sponsored Formula One for 5 years as a Global Partner and Technology Partner of Formula One. until 2013. LG was also an official supplier to Virgin Racing and Lotus Racing team, plus engine manufacturer Cosworth from 2010 to 2012. LG also sponsors London Fashion Week and the LG Arena in Birmingham. During the period 2001–2003, LG sponsored the snooker Grand Prix. During these years the tournament was known as the LG Cup. In 2008 LG became sponsors of the Extreme Sport 'FSO4 Freeze' festival. The LG Electronics company in Australia have dissolved the sponsorship with the former Australian vice-captain, David Warner on 27 March 2018 and dropped him as the brand ambassador of the company over the controversial ball tampering scandal which shook the Australian cricket on the 3rd Test during their 2017–18 tempestuous Test series against South Africa. David Warner had an agreement with LG Electronics company in 2014 and was earlier planned to renew his contract just before being caught for ball tampering row. Choice magazine, in independent tests of popular LG fridge models in 2010, found the energy consumption in two models was higher than claimed by LG. LG was aware of the problem and had offered compensation to affected customers. In 2004, LG made 4A-rated water efficiency claims for numerous washing machines before they were certified. LG gave undertakings to the Australian Competition and Consumer Commission (ACCC) to provide appropriate corrective notices and upgrade and maintain its trade practices compliance program. In 2006, LG overstated energy efficiency on five of its air conditioner models and was again required to offer consumers rebates to cover the extra energy costs. In March 2018, it was announced that one of LG steam clothing care system earned the Asthma and Allergy Friendly Certification. The Hudson Palisades and Palisades Interstate Park with the George Washington Bridge at left. LG Electronics USA in 2016 proposed revised plans to build a scaled-down, 64 ft (20 m) American headquarters building atop the Palisades in Bergen County, New Jersey. Previous plans for a 143-foot (44 m) building had been opposed by environmentalists and other groups. LG Electronics USA had proposed to build a new headquarters in the borough of Englewood Cliffs in Bergen County, New Jersey, including a 143 ft (44 m) tall building that would stand taller than the tree line of the Hudson Palisades, a US National Natural Landmark. The company proposed to build an environmentally friendly facility in Englewood Cliffs, incidental to Bergen County's per-capita leading Korean American population, having received an initially favorable legal decision concerning building height issues. The plan, while approved by the local government, met with resistance from the segments of the general public as well as government officials in New Jersey and adjacent New York. The initial court decision upholding the local government approval was overturned by a New Jersey appellate court in 2015, and LG subsequently submitted a revised, scaled-down, 64-foot building for approval by the borough of Englewood Cliffs in 2016. LG broke ground on the new US$300 million Englewood Cliffs headquarters on 7 February 2017, to be completed in late 2019. ^ a b c d e f "Lg Financial Statements". LG Electronics. 22 July 2013. Retrieved 26 December 2013. ^ ""Lg Financial Statements". FT. 22 July 2013". Financial Times. 26 December 2013. Retrieved 3 November 2016. ^ "Our Brand". LG. Retrieved 7 September 2018. ^ Manufacturing Big for LG, since (2001). "STARION INDIA". starion.co.kr. Retrieved 3 November 2016. ^ "LG Aims to Boost Television Market Share With 3-D, Web-Connected Models". Bloomberg. 16 February 2011. Retrieved 11 July 2013. ^ "LG's History". LG's official website. ^ "LG.com". Retrieved 10 June 2014. ^ Herald, The Korea (21 July 2016). "LG Electronics completes relocation of European HQ to Eschborn in Germany". Retrieved 7 June 2017. ^ "Class-action lawsuit targets LG over legendary G4, V10 bootloop issues". Ars Technica. 16 March 2017. Retrieved 17 March 2017. ^ "LG replaces the head of its struggling mobile business after just one year". TechCrunch. Retrieved 28 November 2018. ^ "LG디스플레이" (in Korean). Daum. Retrieved 22 June 2013. ^ Trenholm, Rich (7 September 2009). "LG SL8000, SL9000, LH9000 and LH9500: TVs without borders | CNET UK". Crave.cnet.co.uk. Retrieved 6 October 2013. ^ "LG's 77- and 65-inch Curved 4K Ultra HD OLED TVs are coming to the UK". Pocket-lint. Retrieved 26 June 2014. ^ "At LG, More Bendable TVs Lie Straight Ahead". The Wall Street Journal. Retrieved 28 May 2014. ^ DoctorBeet's Blog: LG Smart TVs logging USB filenames and viewing info to LG servers. Doctorbeet.blogspot.fr (18 November 2013). Retrieved 9 December 2013. ^ Goodin, Dan. (19 November 2013) Smart TVs from LG phones home with user’s viewing habits, USB file names. Ars Technica. Retrieved 9 December 2013. ^ Engadget.com 26 August 2010. Tim Stevens. Hillcrest Labs brings LG's Magic Motion remote to life, cheekily points out that Sony uses it, too. ^ Greek, Dinah (24 January 2012). "Dragon brings voice control to smart TVs and set-top boxes". Computeractive. Archived from the original on 10 March 2012. Retrieved 22 June 2013. ^ LG's webOS 2.0 TVs are coming to CES. Retrieved 2 January 2015. ^ a b c d Pak, Nataly (17 June 2016). "LG Electronics sells mosquito repellant TV in India". Reuters. Reuters. Retrieved 21 June 2016. ^ "Bloomberg - Are you a robot?". www.bloomberg.com. Retrieved 18 December 2018. ^ "G3's spec". Phone arena. Retrieved 2 July 2014. ^ "LG G Flex appears on the FCC with AT&T-friendly LTE". Engadget. Retrieved 9 March 2014. ^ "LG G Flex announced with vertically curved 6-inch 720p screen, 'self-repairing' back cover". Engadget. Retrieved 9 March 2014. ^ "LG G Flex coming to AT&T, Sprint, and T-Mobile this winter". The Verge. 6 January 2014. Retrieved 9 March 2014. ^ "G4 release date". CNET. Retrieved 6 May 2015. ^ "LG V20 unveiled with Android 7.0 Nougat, dual rear cameras and secondary screen". MobiGyaan.com. 7 September 2016. Retrieved 7 September 2016. ^ "LG G6 officially announced: everything you need to know". 26 February 2017. ^ Reisinger, Don (11 April 2018). "LG Confirms Media Briefing to Introduce G7 ThinQ Android Smartphone". Mobile. eWeek. Retrieved 14 April 2018. ^ "LG G pad series". Android central. 12 May 2014. Retrieved 7 July 2014. ^ "Android Wear platform fully unveiled at I/O 2014". Android Authority. Retrieved 25 June 2014. 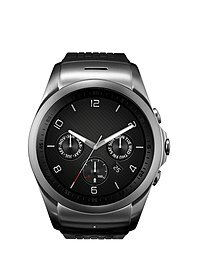 ^ "This Is LG's New Round-Face Smartwatch: The G Watch R". Business Insider. Retrieved 27 August 2014. ^ "LG Watch Urbane review". CNET. Retrieved 12 May 2015. ^ "LG's new Rolly wireless keyboard turns into a pocket stick". The verge. 27 August 2015. Retrieved 27 August 2015. 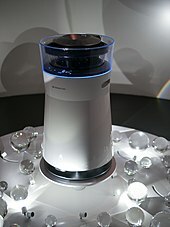 ^ a b "LG Rolls Out Premium Smart Appliances that Chat". lg.com. Retrieved 5 May 2018. ^ "Commercial Partners of the International Cricket Council (ICC)". icc-cricket.yahoo.net. Archived from the original on 25 August 2009. Retrieved 26 September 2009. ^ "The Official Formula 1 Website". Formula One. 26 November 2008. Retrieved 10 June 2009. ^ "London's first ever snow and music festival strengthens LG's corporate sponsorship portfolio". Prlog.org. Retrieved 10 June 2009. ^ "FSO4 Freeze, Sponsored by LG, Snowboard and Music Festival". Londonfreeze.com. Archived from the original on 16 September 2008. Retrieved 10 June 2009. ^ Press, Australian Associated (28 March 2018). "Electronics giant LG drops David Warner as brand ambassador". The Guardian. Retrieved 28 March 2018. ^ "LG drops sponsorship of disgraced Aussie cricketer Warner". South China Morning Post. Retrieved 28 March 2018. ^ Staff, Scroll. "LG Electronics decides to not renew contract with David Warner after ball-tampering scandal". Scroll.in. Retrieved 28 March 2018. ^ Gray, Darren (28 March 2018). "LG decides 'not to renew' David Warner sponsorship". The Sydney Morning Herald. Retrieved 28 March 2018. ^ a b "CHOICE exposes false energy claims by major fridge manufacturer, LG, for its GC-L197NFS". CHOICE. Archived from the original on 25 November 2010. Retrieved 27 October 2010. ^ Limited, Allergy Standards (2018). "Allergy Standards Ltd announce that LG Styler has met the scientific requirements for the asthma & allergy® friendly Certification Standards". ^ a b Matthew McGrath (30 March 2016). "Englewood Cliffs board to consider new zoning for LG Electronics site". NorthJersey.com, part of the USA TODAY network. Retrieved 30 November 2016. ^ Former N.J. governors ask LG to rethink plan for high-rise HQ along the Palisades. NJ.com (7 June 2013). Retrieved 9 December 2013. ^ LG supporters looking for Gov. Christie's help in fight over high-rise HQ on the Palisades. The Star-Ledger. Retrieved 9 December 2013. ^ THE CLOISTERS AND PALISADES | World Monuments Fund. Wmf.org (8 October 2013). Retrieved 9 December 2013. ^ Alana Quartuccio (3 September 2013). "Study Predicts Englewood Cliffs LG Project Will Bring Huge Revenue Boost". Englewood-EnglewoodCliffs Patch. Retrieved 31 October 2013. ^ "NY Comptroller ask LG to consider shorter Englewood Cliffs headquarters". The Star-Ledger. ^ "LG LED / Smart Tv". Archived from the original on 11 December 2015. ^ Michael W. Curley, Jr. (7 February 2017). "LG breaks ground on Englewood Cliffs HQ". NorthJersey.com – part of the USA TODAY network. Retrieved 5 March 2017. Wikimedia Commons has media related to LG Electronics.